Over the last three Drafts, Todd Gurley, Melvin Gordon, Ezekiel Elliot. Leonard Fournette and Christian McCaffrey were all selected within the top 15 picks and elevated the efficiency and productivity of their team’s offense. Paradoxically, the Eagles and Patriots reached Super Bowl LII by employing a running back by committee approach in the backfield. While the zero-running back strategy became popular in fantasy football for a couple of seasons, it appears that diehards once again prefer to draft a three-down runner, who earns 25 touches each Sunday, in the first round to anchor their rosters. Last year, rookie runners impacted box scores throughout the season. Four freshmen ball carriers—Alvin Kamara, Kareem Hunt, Fournette and McCaffrey—finished among the top 12 producers in ppr-scoring formats among running backs. The Class of 2018 offers plenty of appetizing options for fantasy managers to mull over and will be highly sought after in drafts this season. While a draft buff cannot ignore rushing and receiving yards, there are other statistics that provide enhanced insight into a player’s professional potential: Yards per Carry, Receptions, Team Total Yards percentage and athletic ability—40-yard dash, 3-cone drill and 20-yard shuttle—are crucial indicators to examine a prospect. A generational-type talent and immediate impact playmaker as a rookie. Named Big 10 Graham-George Offensive Player of the Year in back-to-back seasons. 2016 All-American running back and 2017 All-American All-purpose/return specialist. During career, recorded three consecutive 1,000-yard rushing campaigns, totaled 5,038 yards from scrimmage, scored 53 times and averaged 11.7 yards per catch. At 6-foot-0 and 233 pounds, freakish athleticism for size with vision, patience, balance and power. Elite literal quickness and hits top speed instantly. An excellent burst and mercurial cutting ability. Darts through small seams. Shifty runner with natural pad level and pronounced body lean. Makes defenders miss in traffic. Lower-body explosion: Runs through, or hurdles over, tacklers. Dangerous to the perimeter and elusive in space. Rapid first step with burst. With quick lateral agility, can be an above average inside runner at the next level. Great hands and feet. Stupendous pass catcher: Plucks ball out of the air with strong hands. Good in pass protection and attacks blitzing linebackers. Three-down ball carrier and can contribute on special teams. High-character competitor who is humble and intelligent. A coaching staff can build an offense around Barkley. An overall top five prospect in April. Electrifying ball carrier, who played behind Leonard Fournette for two seasons. In 2015, SEC All-Freshman Team. In 2016, First Team All-SEC after leading the Conference in rushing with 1,387 yards. During campus tenure, scored on longest run, a 96-yarder, in LSU history against Arkansas and established Tigers’ single-game school record with 285 rushing yards versus Texas A&M. Persistent knee injury last year limited production: 1,251 rushing yards and 13 touchdowns. At 5-foot-10 and 224 pounds, a home run hitter with a rare amalgamation of power and speed. Employs good vision with incredible balance through contact and wonderful wiggle in tight quarters. A decisive runner who accelerates quickly and reaches top speed in a hurry. Explosive playmaker with a dogged style, runs angry and has a little Marshawn Lynch in DNA. Powers ahead for additional yardage: Always keep feet moving. Pronounced center of gravity, strength and agility complimented by colossal suddenness. A violent runner who reads blocks well and blasts through hole. Passionate player who loves the game. Makes defenders whiff and bounces off tacklers. Advanced pass protector who is physical and stuffs opponents: Above average hands and route runner in the passing game. Incredible story overcoming adversity: Murdered father, hard-working mother and grew up amid poverty. Despite making big plays at LSU, concerns about 40-yard time. At Combine, recorded a sub-4.5 40-yard time. Not a lot of experience in a sophisticated passing game. Should be selected in the first round of the Draft. In a storied career, finished as the second all-time leading rusher in SEC and Georgia history with 4,769 yards, trailing only Herschel Walker. Eclipsed 1,000 yards rushing three times (2014, 2016 & 2017). In 2014, SEC Freshman of the Year with 1,547 rushing yards. Surpassed 100 yards rushing 24 times and 200 yards in three games. In 2015, catastrophic injury versus Missouri, missing the final seven games: Torn PCL, MCL and LCL, but did not tear the ACL. Team doctors and personnel evaluators will surely want to scrutinize knee during the draft process. At 5-foot-10 and 227 pounds, powerful and compact runner who breaks tackles and lowers his head into opponents. A deceptive runner with great vision and quick feet. Shifty playmaker with short and choppy steps. Sheds defenders and accelerates into the second-level of the defense. Rips off huge chunk of yards once in the open field. Stupendous lateral agility and makes impressive jump cuts. Effective between the tackle, gets skinny in the hole and plows through defenders. Difficult to tackle one-on-one: Low center of gravity, perfect balance and strong leg drive. 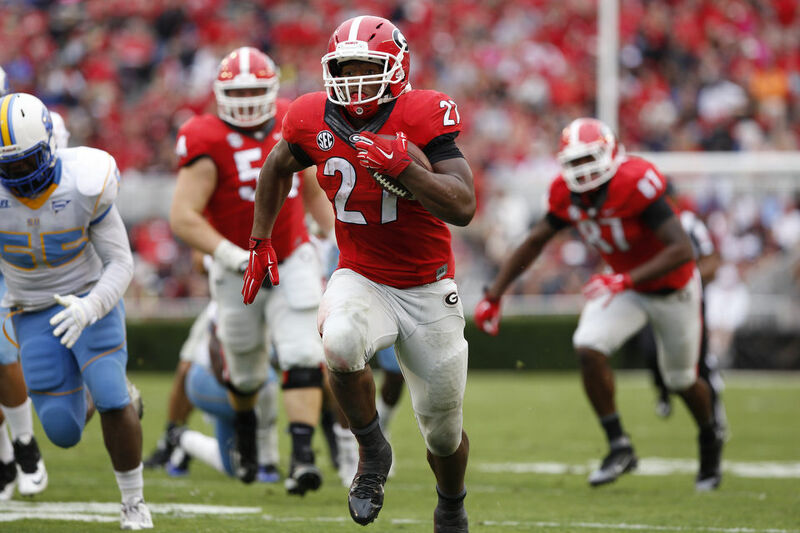 Is Chubb a three-down back? Struggles in pass protection and rarely employed in the aerial assault. Must improve as a pass blocker and route runner in order to earn playing time. Can be explosive on the edge but questions remain about straight-line speed and suddenness against NFL competition. A tremendous asset if available after the second round of the Draft. A member of one of the most explosive running back duos in the history of college football. Played behind Nick Chubb as a freshman. In 2015, became the starter after Chubb’s injury and named Bulldog’s Offensive MVP. Shared carries with Chubb the past two seasons. Surpassed 1,000-yards rushing twice (2015 and 2017). Totaled 3,613 career rushing yards on 590 carries and scored 39 touchdowns. At 5-foot-10 and 214 pounds, physical one-cut runner with quick feet. An instinctive and downhill runner. Explodes through the running lane: Decisive ball carrier, who sees the hole, plants foot and blasts off. Between the hash marks, presses the hole, identifies the opening and bursts through arm tackles in traffic. Good patience and anticipation. Keeps legs and feet churning and powers through defenders. Very good short area quickness. Elusive and tough. Rapidly reaches the second level of the defense. Effortless agility: Turns corners and changes direction. Home run hitter. Very good pass catcher: Solid route runner, creates separation with clean breaks and beats linebackers in space with speed. Aggressive and willing pass blocker who can be special knocking off blitzers. Limited usage over career and not a lot of tread on the tires. Throughout career has dealt with injuries. The next great Georgia runner—H. Walker, R. Hampton, T. Davis, O. Gary G. Hearst, K. Moreno and T. Gurley—in the NFL. Eye-opening senior season at San Diego State last year. In College Football history, totaled the fifth best single-season rushing mark (2,248) and the twenty-ninth player to record a 2,000-yard crusade. Rushed for over 200 yards six times and ended college career with five consecutive 200-yard games. Named Consensus All-American and MWC Offensive Player of the Year. Impressive game against Stanford: 32 carries for 175 yards and a touchdown as well as five catches for 31 yards. In 2016, rushed for over 1,000 yards on only 136 carries. Prolific special teams player, returning seven kickoffs and one punt for touchdowns. At 5-foot-11 and 220 pounds, workhorse playmaker with a solid frame and physical running style. Navigates through traffic well with good vision, agility, patience and balance. Subtle and sudden quick cuts. Good leg drive and fights for every yard possible. Explosive burst and accelerates to top speed quickly. Breaks tackles and tough to bring down. Good lateral jump cuts in the hole. Can be flexed into slot or out wide on passing downs. Fumbling concerns. Liability as a pass blocker: Poor technique and must improve effort. Skill set foreshadows a professional career as a two-down back. In the illustrious history of USC football, finished fifth all-time with 3,691 rushing yards. Led Trojans in rushing all three seasons on campus. Broke school record for rushing yards as a freshman with 987. Over past two campaigns, recorded back-to-back 1,000-yard seasons (1,082 & 1,550). Scored 42 career touchdowns. In 2017, AP All-American Third Team and All-PAC 12 First Team. At 5-foot-11 and 205 pounds, violent one-cut runner with fluid hips: Plants foot and accelerates up field. Fantastic lower-body strength: Easily hurries in and out of cuts. Very good vision and does not hesitate through the opening. Good balance and fights through arm tackles. Comfortable between the hash marks. Blasts through the hole with a low pad level: Battles for the extra yard. A classic slasher employs jump cuts to escape defenders and spins and bounces off would-be tacklers. Patient runner with light and dynamic feet. Strings together ankle-turning moves. Track-sprinter speed and a threat to reach the promised land on every carry. Runs upright into the second level of the defense. Often creates positive yardage out of nothing. Capable pass catcher: First two years, the Trojans did not employ Jones in the aerial assault. Last year, he ran more routes out of the backfield. Struggles protecting the passer because of lack of mass but is willing to engage blitzer. Lean frame might limit workload. Does not project as a short-yardage runner: Lacks pile-moving strength at point of attack. Would be ideal to add 10-15 pounds. Only 20-years old when training camp opens. Injured hamstring running the Forty during the Combine. Expect one team to fall in love with skill set and potential.